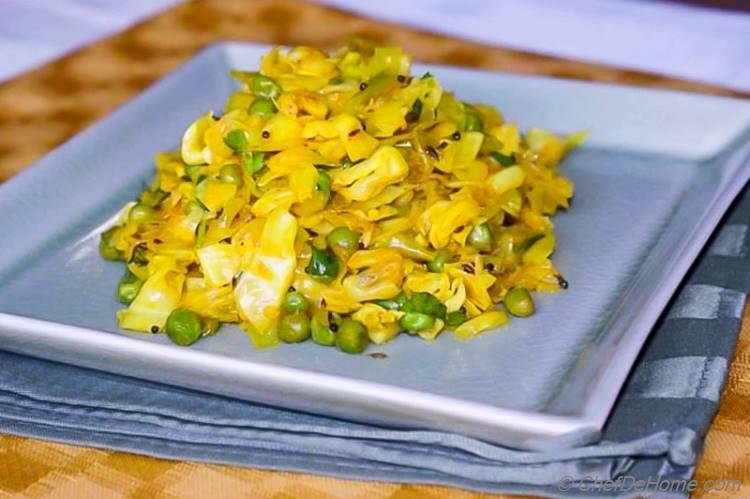 As a flavorful vegetarian side or meat-less main course, this vegan and gluten free Indian Curry Cabbage keeps dinner healthy and delicious! 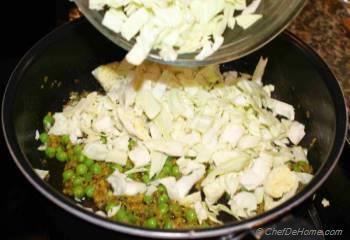 Cabbage (Pata Gobi) Matar (Peas) Sabzi (or sabji) is very delicious, every-day meat-less main course in Indian Homes! and my home is not different! 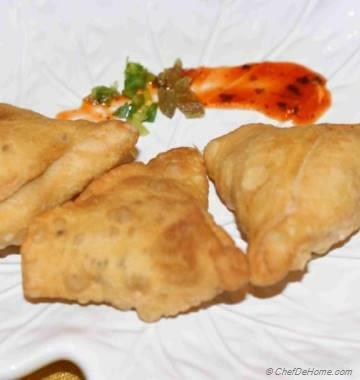 This versatile dish can be eaten as both: main course or as side with meat main course! My family love enjoying, an easy and lite Indian dinner with Cabbage and Peas stir-fry and side of whole wheat roti and yogurt (curd) raita. This is a kind of meal which you can prepare under 30 minutes! 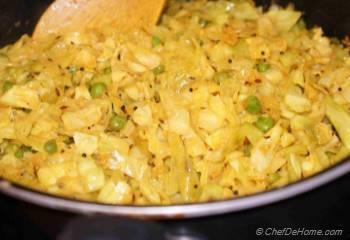 Once masala (onion mixture and spices) for Sabji are cooked, you just add cabbage and let it get little tender. While cabbage cooks, just warm the Roti and make Raita! 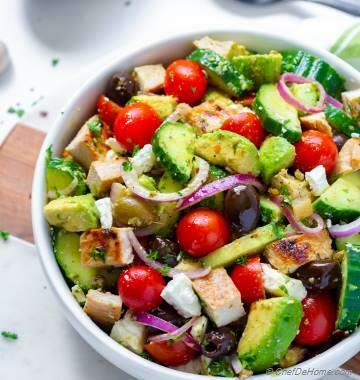 In no time, a healthy dinner is ready to-be devoured! 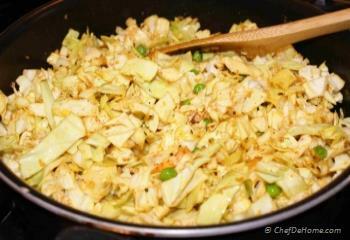 Earlier I used cook cabbage (pata gobi) until it gets very soft and tender. This is actually the way I grew-up eating it. 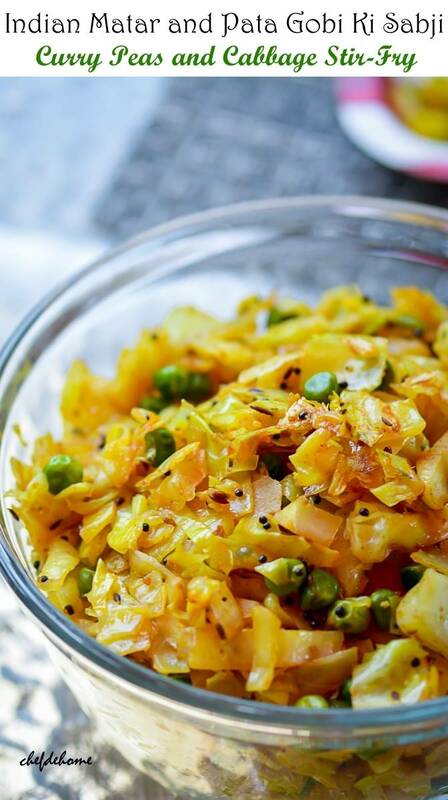 However, Vishal likes Matar Pata Gobi Ki Sabji, a little on crunchy side. So, these days I have started cooking it little less. Good for me, now it get's ready even quicker! Traditionally, many people add tomatoes to this dish for some tang. But I have never added tomatoes. I think tomatoes make Pata Gobi very soggy and not-appealing.... Instead, I add 1 teaspoon of lemon juice just before finish-ing the cooking. 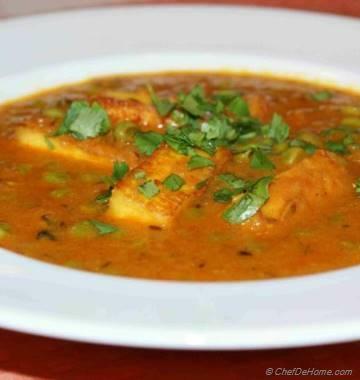 This adds much needed tang and gives savory notes to Mata Pata Gobi Sabji! Try it once! I'm sure will LOVE the sweet and tangy flavor. I promise! 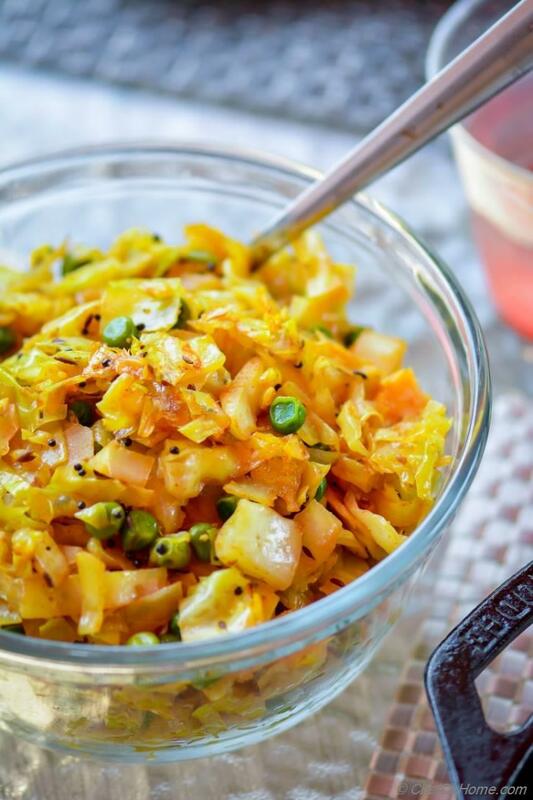 This quick cabbage recipe is also works perfect for a main-course-side. Serve with grilled meat dinner to include a hearty serving of vegetables in your family's meal! Nutrition Info: This side is gluten-free, vegan, dairy-free and also for paleo diet. For paleo, just use natural cold-pressed olive oil instead of refined canola oil. Friends, I'm sure you'll have some cabbage in refrigerator! 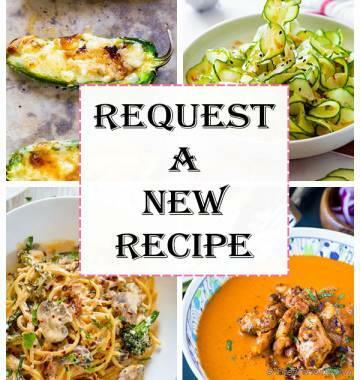 Don't wait, try it tonight and let me know how you like it…. 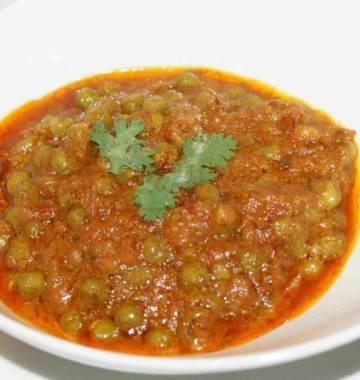 Smart Swap Replace Green Peas with Chickpeas to make this Side more substantial! 1. Grind onion, garlic, green chilies to a coarse consistency. 2. Heat oil in pan. Add mustard seeds and let'em start to cracker. Now, add cumin seeds, fry for 20 seconds. 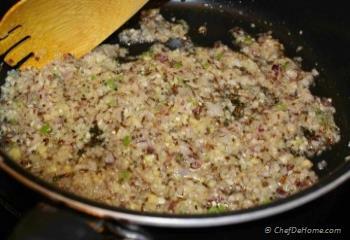 Then, add ground onion mixture and fry until onions are soft and have started to brown a little. (about 4-5 minutes) Add turmeric and peas, fry for 1 minute. 3. 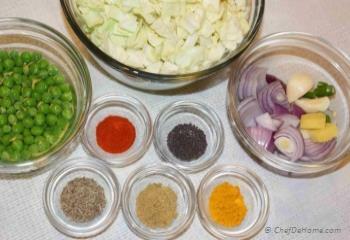 Now add chopped cabbage, half of salt, and all other spices mentioned in ingredient list. 5. Add chopped coriander and lemon juice. Stir to combine. 6. Server with your choice of Indian naan bread or roti. 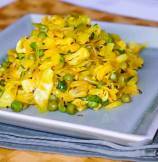 You can also serve cabbage stir-fry as vegetarian side dish with meat or seafood main course. Tried it, ate it, loved it. Thanks! I'm glad you enjoyed. Thanks for the feedback. Excellent dish. One of our favorites! Thanks Brenda, I'm glad you enjoy it. Nice recipe.How many cups of cabbage? Hi Megha, I did not count number of cups and always eye ball it. but usually a medium cabbage is a medium bowl full. I would say, 5 cups of shredded cabbage. I hope it helps. Meg , thanks for your kind words. I hope you like it when you try!